A stirring haka in Volvo Ocean Race Sanya for handover ceremony. Emirates Team New Zealand’s Camper left the dock for the start of Leg 4 to Auckland on Sunday 19 February with a stirring haka farewell from performing group Pounamu. 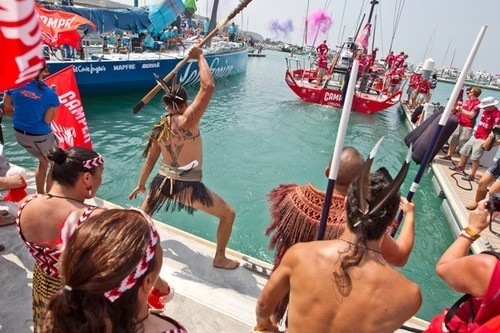 Earlier, Maori culture mixed with Chinese dragons as kapa haka took centre stage at the official handover ceremony from Sanya to Auckland as the Volvo Ocean Race fleet prepared to leave China. Auckland based performing group Pounamu made the trip to China as part of the Auckland Stopover delegation and featured in the global television coverage of the Start of Leg 4 to Auckland. The NZ delegation was led by Auckland Stopover chairman Sir John Wells and Port Director Tom Mayo. The start has been postponed for 17 hours, due to the influence of a monsoon in the South China Sea. Today’s race has instead been turned into an inshore affair, with the boats competing for positions of the starting grid for the restart, which will get underway at 0700hrs local time.